The Environmental Protection Agency released a very troubling preliminary risk assessment that the routine use of the chemical atrazine is likely harming animals and our ecosystems. Atrazine is manufactured and distributed by Syngenta, a foreign global chemical company, that markets the product in the U.S. to limit plants that may compete with commodity crops or would be considered weeds on golf courses. The EPA memo that was released was hand-signed by six scientists in the U.S. government's Environmental Risk Branch of the Environmental Fate and Effects Division. The 500+ page study was co-authored by Dr. Frank T. Farrugia, Colleen M. Rossmeisl, Dr. James A. Hetrick, and Melanie Biscoe, and was subject to peer review by twelve other scientists. Its top-line findings are "based on the results from hundreds of toxicity studies on the effects of atrazine on plants and animals, over 20 years of surface water monitoring data, and higher tier aquatic exposure models." In layperson's terms the findings show that independent government scientists have a high level of concern about the risks to mammals, amphibians, fish, birds, and plants when Syngenta's "weed-killer" is used in quantities recommended by the company. [A]quatic plant communities are impacted in many areas where atrazine use is heaviest, and there is potential chronic risk to fish, amphibians, and aquatic invertebrates in these same locations. In the terrestrial environment, there are risk concerns for mammals, birds, reptiles, plants and plant communities across the country for many of the atrazine uses. EPA levels of concern for chronic risk are exceeded by as much as 22, 198, and 62 times for birds, mammals, and fish, respectively. The breadth of terrestrial plant species and families potentially impacted by use at current labeled rates, as well as reduced rates of .5 and .25 lbs a.i./A, suggests that terrestrial plant biodiversity and communities are likely to be impacted from off-field exposures via runoff and drift. Average atrazine concentrations in water at or above 5 ug/L for several weeks are predicted to lead to reproductive effects in fish [and a lower amount over 60 days] has a high probability of impacting aquatic plant community primary productivity, structure and function. Atrazine has been barred in Europe since 2004. Despite the seriousness of the concerns about the adverse effects of atrazine--or perhaps because of them--the memo, which was signed on April 12 and published at the end of last month, was quietly removed from the EPA's website. The Center for Biological Diversity preserved a copy and made it available here. According to Open Secrets, Syngenta spends well over a million dollars a year on reported lobbying of Congress and federal agencies to limit the regulation of the chemicals it markets to American businesses and consumers, in addition to an untold sum on public relations in the U.S.
Syngenta, which is based in Basel, Switzerland, reported revenue of $13.4 billion dollars last year, 3.4 billion of which was from sales in North America from atrazine and other products. Last year, it reported spending more than $2 billion globally on marketing and distribution. The company is often described as the largest pesticide manufacturer in the world, and just last year it deflected an attempted merger by Monsanto, an even larger global chemical company (one with an even wider array of controversial products and practices). As part of a major investigation in 2012, the Center for Media and Democracy's PRWatch documented Syngenta's PR plan to hide behind chemical industry front groups, like the self-named "American Council on Science and Health" (ACSH) to try to sway public opinion. As CMD/PRWatch noted: "Documents obtained by CMD show show that Syngenta has been a long-term financial supporter of ACSH and that in the midst of reports about spikes in atrazine levels reported by the New York Times, the Natural Resources Defense Council, and the Huffington Post Investigative Fund, ACSH sought an additional $100,000 to produce more materials about atrazine in addition to seeking increased funding in general by Syngenta." Specifically, Gilbert Ross (a physician who was convicted of fraud) who is a long-time leader of ACSH wrote to its "Dear Syngenta friends" that it was eager to do that $100K project, which was "separate and distinct from general operating support Syngenta has been so generously providing over the years" to fund ACSH's operations, funding ACSH called "the lifeblood" of its work. That document, which can be downloaded below, was filed with a court in litigation over Syngenta's Atrazine. Last year, CMD published additional details about ACSH and the corporations that have funded it--such as Altria, the American Petroleum Institute, Bayer CropScience, the Bradley Foundation, Bristol-Myers Squibb, Chevron, CropLife America, Donors Capital Fund, DonorsTrust, ExxonMobil, PhRMA, the Randolph Foundation, and Searle Freedom Trust and more--with its many controversial claims and agenda items, here. CMD's initial investigation of Syngenta was based on documents in court filings that CMD reviewed. Those documents also revealed how Syngenta's PR team targeted scientists, like Dr. Tyrone Hayes, and reporters, like Huffington Post's Danielle Ivory, and how they launched a multi-pronged campaign to spin public perception in the face of growing concerns about potential health risks of atrazine. Hayes' suspicions--that he was being investigated and undermined by Syngenta in response to his studies tying frog mutations to atrazine exposure--were confirmed by the documents CMD published as part of its investigation. The effects on him and his career as an independent scientist were the topic of a major New Yorker article in 2014. Since CMD exposed Syngenta's PR scheme, the U.S. Chamber of Commerce has been paying for Google ads for the past four years attacking CMD, among other attempted retaliatory efforts by Syngenta or its allies. "Atrazine alters sexual hormone levels, and the effects of that, especially at the embryonic stage, can be life-threatening or have life-long impacts. If it affects the immune system, and it can, then it can be life-threatening, or cause long-term chronic inflammation and all kinds of long-term chronic disease. The nervous, endocrine and immune systems are all interconnected, and if you get hit on any of them, you're likely to get hit on them all." 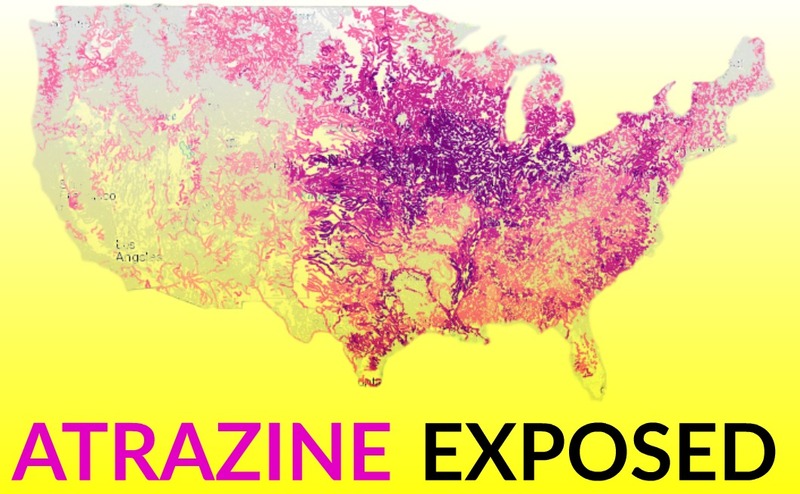 Atrazine is the second-most widely used herbicide in the U.S. (behind Monsanto's glyphosate product, Roundup), with more 70 million pounds entering our environment each year. Syngenta PR's Weed-Killer Spin Machine: Investigating the Press and Shaping the "News"
The court filings detailing Syngenta's PR plans and additional information can be accessed at CMD's Atrazine Exposed, which is part of CMD's specialized online encyclopedia, SourceWatch. Lisa Graves is CMD's Executive Director and formerly served as Deputy Assistant Attorney General in the Office of Legal Policy at the U.S. Department of Justice under both Attorneys General John Ashcroft and Janet Reno, as the Deputy Chief of the Article III Judges Division of the Administrative Office of the U.S. Courts under appointees of Chief Justice William H. Rehnquist, and as the Chief Counsel for Nominations for the U.S. Senate Judiciary Committee. She previously led the national right-left coalition on national security and civil liberties issues before taking on the leadership of CMD in 2009. I would argue that Atrazine is a well known problem herbicide with well know problems due to its persistence in especially water. Glyphosate which is a lot safer and less persistent substantially replaced atrazine when you have GM crops that are engineered to be tolerant. This has had great benefit to the land despite what activists or people who speculate that all government and corporate people are corrupt and the activists are 100% pure. I was a member of the Friends of the Earth for a while and realized that many NGOs are just against things. They are not trying to encourage a better approach. We would all love to produce food cheaply with zero impact on the environment as if the crop wasn't there but the biggest impact is growing any crop any way. If we assume we need to grow the crop and you assume that most major row crops need weed control how can you do that effective such that the farmers doesn't go bust ! Atrazine is not the best . Glyphosate is better. If you examine the recent concern about glyphosate safety you will see that no government agency that has assessed glyphosate safety says its a carcinogen. EPA and EU have recently reviewed again (EU took 4 years) and say it is not a carcinogen. The WHO has 4 groups that opined on glyphosate safety the activists only quote one of the 4 - they took 4 HOURS and put it into the same risk category as processed meats and working nights or in a barber shop (I am not kidding). This hazard assessment has spread like wild fire with a bunch of ill informed politicians jumping on it as proof it causes cancer. The other 3 parts of WHO say its fine (that is ignored). 4 HOURS is a much more reliable review than 4 YEARs apparently. Even the WHO group who had a negative view said this is a hazard assessment and risk is hazard x dose x exposure and their assessment should be used to legislate. Another result of this is lawyers salivating and trying to make money suing Monsanto but they have failed. To trolls-Monsanto's own research, don't attack me! During its years investigating glyphosate’s bioactivity, Monsanto conducted hundreds of trials on mice, rats, beagle dogs, rabbits and other life.The EPA has known this since 1980 and functions as a department of the biotech industry not to protect Americans. Among the many cancers and diseases Monsanto’s own research found associated with glyphosate are: Adenoma cancer-pituitary gland, Glioma tumors-brain, Reticular cell sarcomas-heart, Malignant tumors-lungs, Salivary mandibular reticular cell carcinoma, Metastatic sarcomas-lymph gland Prostate carcinoma, Cancer of the bladder, Thyroid carcinoma, Adrenal reticulum cell sarcomas, Cortical adenomas, Basal cell squamous skin tumors, In female mammals-cancers of the lung, liver, thymus, stomach, bladder adrenal glands, ovaries, colon, uterus, parathyroid and mammary glands. Samsel and Seneff also noticed that Monsanto had conducted many long-term studies.